In October, the shuttered Lucky Dragon casino in Las Vegas failed to receive a single bidder at its opening price of $35 million. As a result, the ill-fated $160 million property reverted back to its owner, Snow Covered Capital, which is linked to real estate investor Enrique Landa of Associate Capital. In November 2016, the Lucky Dragon Hotel and Casino became the first major casino to open in Las Vegas in the aftermath of the 2007-2008 financial crisis. The Chinese themed resort cost $160 million to complete, and was designed to lure large numbers of Chinese people from all across the United States, as well VIP gamblers from mainland China. The venue features a 27,500 square feet casino space complete with 30 gaming tables, 300 slot machines, and overlooked by a one-and-a-quarter-ton glass dragon chandelier. The property’s other amenities also include a 203-room hotel, and Asian inspired restaurants. Unfortunately, its highly specialized offering failed to gain the level of interest envisioned by its creator. In January 2018, the Lucky Dragon’s casino and restaurants were subsequently closed, and the following month the property filed for Chapter 11 bankruptcy protection. In October, the final nail in the coffin came after its nine-story hotel tower shut, and the venue was sealed off from the public with a chain-linked fence. Snow Covered Capital has since described the development as a “dismal failure”. 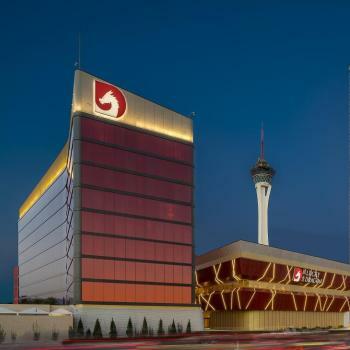 What Next For Lucky Dragon? The Lucky Dragon apparently attracted over 80 prospective buyers while it was being extensively marketed ahead of auction, according to Michael Brunet. The auction was then held on Oct. 30 at the Nevada Legal News building, 930 S. Fourth St., near Charleston Boulevard, with around 50 people in attendance, none of whom placed a bid. Meanwhile, John Knott from commercial real estate firm CBRE Group is trying to help sell the resort, and said that some of these businesses will now be studying the property further, looking into financing possibilities, and trying to devise suitable business plans. It remains to be seen just how much anyone will be prepared to shell out for the property, though. It is a lot smaller than many of Las Vegas’ other casinos, and by specializing in one group of customers it has severely limited its wider market appeal. Furthermore, Lucky Dragon is located off the quieter north Strip, meaning its foot traffic is negligible. It has even been suggested that the resort might end up opening not as a casino, but some other type of venue, with an e-sports lounge one of the ideas touted. The Lucky Dragon is just one of many casinos to have suffered fall out from the global financial crisis of 2007–2008. Other examples include Station Casino filing for Chapter 11 bankruptcy in 2009, followed suit in 2011 by the Hooters Hotel, and The Westin Las Vegas. The market has since recovered from its doldrum years, and in 2017 Nevada’s casino gambling revenue surpassed $40 billion for the first time in state history. Atlantic City is another of the country’s great gambling destinations to have taken a hit from the economic downturn. In 2014, five of the city’s twelve casinos shut shop, including Revel, which originally opened two year’s earlier at a huge price tag of $2.4 billion. Like Sin City, Atlantic City has since recovered, and in 2016 it posted its first annual gain in ten years.